Walking into Hammock Juice Station is an odd experience; its located on a busy street in Eixample, with cars racing by and dozens of pedestrians pushing through the crowd. But once you enter, silence takes over. 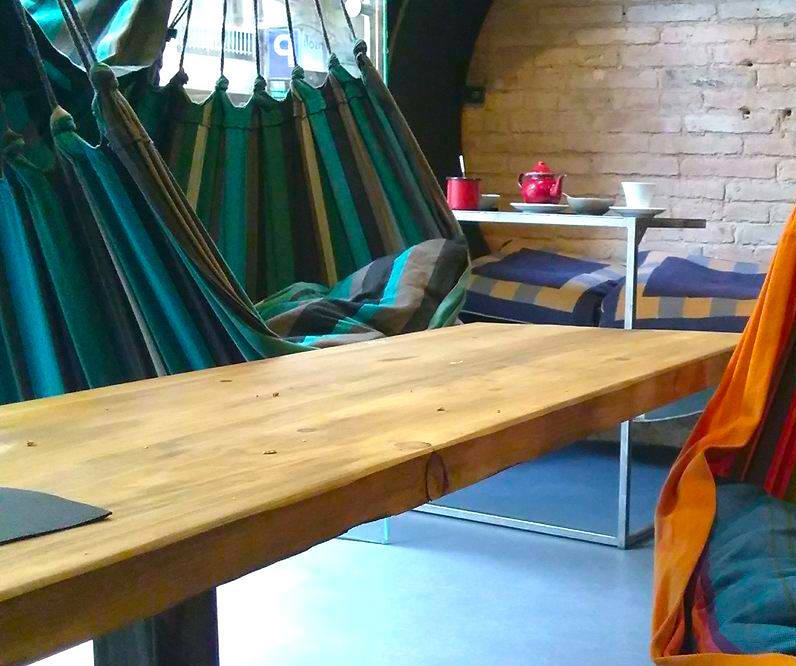 Everyone inside this innovative place is comfortably seated in a hammock, sipping away at some creative juice or smoothie. The loudest noise you’ll hear is the person next to you, flipping to the next page of their novel. The smoothies are some of the most creative you’ll find in Barcelona; who would’ve even guessed that Himalayan salt and dried dates would be so delicious in a smoothie!? Not only does Hammock Juice Station, have innovative smoothie recipes, but I would like to zone in on the hammock part. I love hammocks, they are soft and comfortable and coddle you. Like a big warm hug. Hammocks are known to have some beneficial health impacts as well, resting in a hammock can help alleviate back pain, help you focus, and concentrate better = better reading, and the gentle swinging motion can relax you. So going to this place for a healthy and filling beverage, and then getting into a hammock and improving brain function and decreasing pain seems like a win-win situation to me. The only downside? Walking down the bust street to get there.